By this point, before you laid eyes on this review, you probably have scoped out several other steam irons on the market. You probably have checked out barebones steam producing units that deliver the bare essentials: heavy steam paired with decent pressure and high heat. You probably have also seen all sorts of wonderful extra features paired with the bare steaming essentials. You might have seen everything from very light cordless units to small ‘lite’ steam irons to heavy or gargantuan two piece steam irons with dedicated steam generators. You might have also become aware of different anti-drip technology that prevents one of the most dreaded situations in steam ironing-drips on fabrics which require extra work. This is all well and good but you might want to consider one additional factor: ease of maintenance. Steam irons, just like other appliances, require some level of maintenance. Depending on the model you purchase, you might have to put in more work maintaining the iron or at least handling it a certain way so as to keep its ironing efficiency intact. You might also have to do a few maintenance tasks to prolong its product life. This is going to be a problem if you are the typical consumer. You’re simply too busy for the maintenance. In such a case, it would make a lot of sense to pick among different steam iron models based on ease of maintenance. 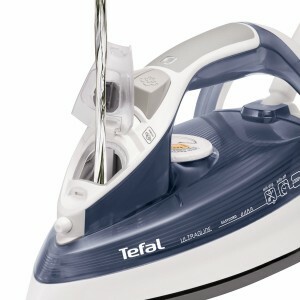 This is precisely the advantage, the Tefal Ultraglide FV4488G1 antiscale stream iron brings to the table. While the Tefal FV4488G1 plays up its ease of maintenance as its main value proposition, you can’t just pick up this model based on such claims. 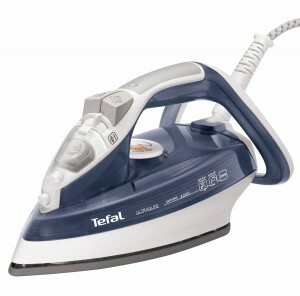 For this model to be a good buy, it has to make a decent showing in terms of steam iron fundamentals. What are the bare minimum standards for a steam iron? Simple-it has to produce enough steam at a high enough pressure level mixed with high enough temperatures. Thankfully, this Tefal model does all this with flying colors. Delivering a decent 35 gram per minute continuous steam flow, this unit can also produce a 100 gram per minute steam shot. Although it is obvious you can get much better steam production and more steam power with other models, this model acquits itself well enough on the basic steam threshold requirements that you can safely move on in your analysis to its other features. If it failed this basic threshold, there would be no need to check out its other features. Doing so would be pointless since it would have failed to do its basic job. Thankfully, it does a decent job with the bare minimum steaming essentials so we can check out its other features. The next ‘fundamental’ basic analysis you should do before you move on to the ‘extras’ that make or break a steam iron model is how easy it is to use. This is no small consideration. Let’s face it, the longer you own an iron, the more fibers get stuck to its soleplate. Even the cleanest-looking gleaming iron is going to slow down if its soleplate gets ruined by many partially melted stuck fibers. This accumulation creates a heavy drag on the surface you’re ironing and it will take more passes to smooth out a surface than before. Eventually, ironing would take too much effort that you would have to buy a new steam iron. Thanks to this unit’s ‘Ultraglide’ soleplate, you don’t have to worry about having a tough slog ironing through a surface. The soleplate seems to glide off the surface and it doesn’t take much effort to push the iron from Point A to Point B. you don’t have to make too many passes and you can complete your ironing load sooner rather than later. All this adds up to less effort, less hassle, and yes, less frustration. 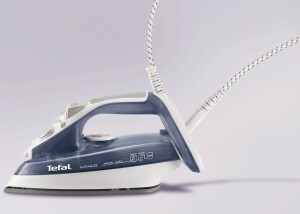 The Tefal Ultraglide FV4488G1 is able to deliver a smooth and easy ironing experience because of its ultraglide soleplate. 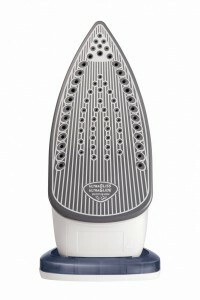 Designed for smooth and easy ironing, you get less drag than other steam irons on the market. All this combines to a much easier experience ironing. It will take a loner time for fiber accumulations to slow down your iron. As I mentioned earlier, one of the key factors many consumers shopping for steam irons miss out or neglect is the issue of maintenance. Don’t overlook this or else you might end up regretting why you bought a particular model instead of another. Maintenance can eat up your time. After all, why bother with maintaining your iron when you can just iron straightaway? Thanks to this unit’s anti-calc feature, you don’t have to worry about cleaning your iron’s water channels. This model is designed to minimize the build up of calcium and other hard water deposits that can clog up water channels. Such clogging doesn’t just mean extra work when you iron your materials. They can also mean your iron might blow up due to the built up steam and pressure that’s caused by blocked vents. Designed to cut down on hard water deposit formation, this model gives you quite a bit of peace of mind since you don’t have to actively clean the iron. The iron’s anti-calc features save you lots of time and unnecessary maintenance-related headaches. Another great low-maintenance feature of this model is its easy fill design. You only need to pop open a lid at the front and top of this unit to pour in water. Instead of the normal narrow water channel, the water input channel is quite wide so you don’t have to have super steady hands to avoid spills. Since refilling is a key part of appliance maintenance, this easy fill feature is definitely welcome and reduces your overall effort levels when handling this appliance. When it comes to long term value, the Tefal Ultraglide FV4488G1 Anti-Scale Steam Iron is great because it gives you peace of mind, less headaches, and is very practical. It takes care of basic steam ironing needs while delivering ease and convenience. It also costs only 27 GBP so you don’t have worry about this model’s extra features setting you back much. What’s not to like?